To celebrate my very first blog post on my new blog I needed a cake. That said cake would include chocolate, was a no brainer. Chocolate belongs to every kind of celebration, even if it's just a virtual first birthday party, with me as the only guest. Colourful sprinkles were a must aswell, because without them every cake is only half as beautiful. Of course the range of possible recipes is huge, and promply I found myself looking at pictures of the most beautiful tartes, the highest cakes and the most delicate cupcakes. But somehow things never go as planned. All of a sudden it was Karneval where I live and I was invited to my Grandparents house for Sunday afternoon. That I would bring some kind of baked goods was obvious, as this has been my departements for some time now. Even though my Grandparents enjoy everything I bake (as they are my grandparents), I know, that they prefer a ''classic'' cake to fancy cupcakes. So I decided on the Tuscan Chocolate & Almond Cake, which my Mom and I found in a new cookbook of hers. 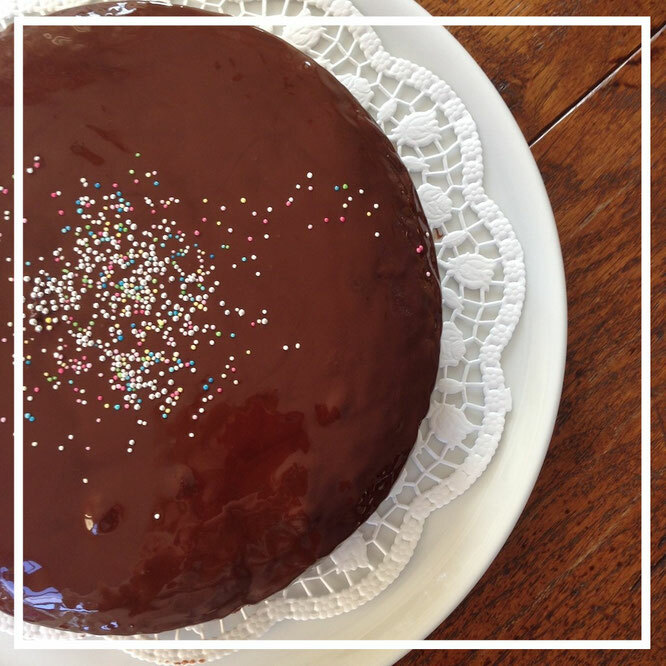 The cake is so easy and quick to make and really is very delicious. Because of the ground almonds it is extremely moist and has a wondeful almond-y aroma, which goes so well with the chocolate. My grandparents loved the cake so much so that I left them with half of it. And that's what makes a cake, or any baked good so special: Sharing it with loved ones, taking the time to sit together and eat. And this is what I hope to make of this little internet space I call mine now: Sharing recipes as well as sharing stories with as many lovely people as possible. Coat the Springform with Butter and put it aside. Preheat the oven to 160°C. Grind the almonds and the chocolate together, for example with a mixer. Cream together the butter and the egg yolks as well as the sugar until light and creamy. Beat the eggwhites with the salt until stiff peaks form. Fold in the ground almonds and the ground chocolate under the butter and sugar mixture. Take one half of the eggwhites and carefully fold it under the almond mixture, then fold under the second half until everything is combined. Put the batter in the prepared springform pan and even it out with a spatula or a knive. Bake it according to your oven for 45 to 60 minutes. To see whether the cake is done, take a dry spaghetti and prick the cake. If the spaghetty comes out clean with only crumbs sticking to it, the cake is done. Let the cake cool completely and take it out of the pan. Slowly let the couverture melt on a double broiler and when it's melted completely, let it stand for about 10 minutes to cool. Put the cake on a wire rack with foil or a baking sheet under the wire rack and evenly spread the chocolate on the cake. Let the frosting dry and then you're ready to serve!